Wholesale sales edged up 0.1% to $63.3 billion in January. Sales were up in four of seven subsectors, accounting for 66% of total wholesale sales. Increases in the food, beverage and tobacco and the machinery, equipment and supplies subsectors were almost completely offset by declines in the building material and supplies and the motor vehicle and parts subsectors. In volume terms, wholesale sales increased 0.5%. The food, beverage and tobacco subsector rose 3.1% to $12.3 billion in January, following a 1.8% decline in December. This was the largest monthly dollar increase since May 2016. Sales were up in two of three industries, led by the food industry (+3.6%). Sales in the machinery, equipment and supplies subsector were up 1.6% to $13.1 billion, mainly on the strength of higher sales in the other machinery, equipment and supplies industry (+8.9%). This subsector recorded the largest year-over-year increase of all subsectors, up 13.4% from January 2017. Following two months of declines, sales in the personal and household goods subsector rose 0.8% in January to $8.7 billion. Sales were up in three of six industries, led by the home entertainment and household appliance (+12.7%) and the pharmaceuticals and pharmacy supplies (+1.3%) industries. Sales in the building material and supplies subsector fell 4.0% to $8.9 billion, the first decline since August 2017. Two of three industries were down, led by the metal service centres industry (-15.3%). The motor vehicle and parts subsector also declined in January (-1.6% to $11.6 billion), the second consecutive monthly decline and the lowest level since June 2017. Sales in British Columbia rose for the third time in four months, up 1.4% to $6.7 billion in January. Four of seven subsectors had higher sales, led by the motor vehicle and parts (+7.2%), miscellaneous (+6.1%) and machinery, equipment and supplies (+4.5%) subsectors. The motor vehicle and parts subsector rose to $849 million in January, the first gain in three months and the largest monthly dollar increase since August 2016. 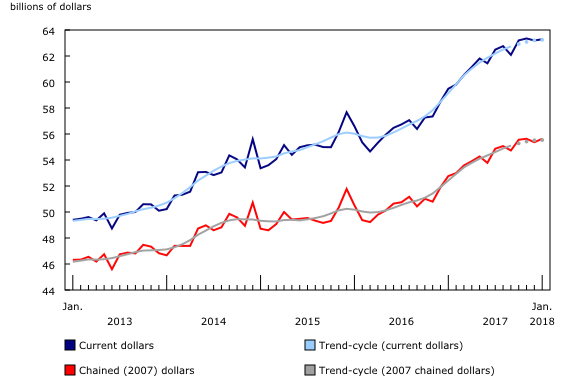 Sales in Ontario rose 0.2% to $32.6 billion in January, on the strength of higher sales in the food, beverage and tobacco (+5.1%) and the personal and household goods (+4.3%) subsectors. The food, beverage and tobacco subsector increased for a second time in three months to $5.4 billion, while the personal and household goods subsector rose for the first time in three months to $4.9 billion. 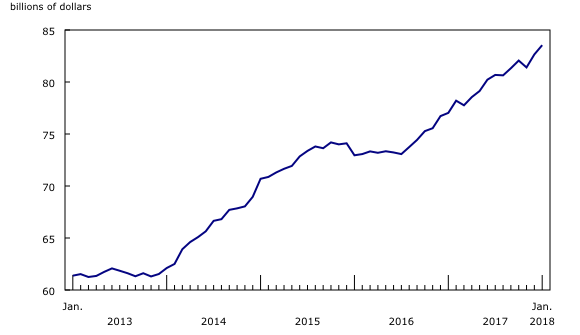 After declining 1.9% in November and 1.1% in December, sales in Manitoba rose 1.6% to $1.7 billion in January on the strength of higher sales in six of seven subsectors. The miscellaneous (+3.3%), food, beverage and tobacco (+1.7%) and farm products (+5.2%) subsectors led the gain in January. Saskatchewan recorded a third consecutive decrease in sales, down 3.3% to $2.2 billion in January. Five of seven subsectors declined, with the machinery, equipment and supplies subsector (-11.0%) accounting for the majority of the drop. The decline for this subsector follows a 13.1% increase in the previous month. Wholesale inventories rose for the second consecutive month, up 1.1% to a record $83.5 billion in January. Five of seven subsectors posted increases, representing 73% of total wholesale inventories. In dollar terms, the personal and household goods subsector (+2.7%) posted the largest gain, following a 2.4% decline in December. The personal goods (+15.6%) and the pharmaceutical and pharmacy supplies (+2.0%) industries contributed the most to the upturn. Inventories grew 1.4% in the machinery, equipment and supplies subsector, a fourth increase in five months. The majority of the rise was driven by the other machinery (+9.1%) and farm, lawn and garden (+2.5%) industries. Higher inventories in the motor vehicle and parts subsector (+2.4%) were led by increased stock in the motor vehicle industry (+2.8%). The inventory-to-sales ratio rose from 1.31 in December to 1.32 in January. This ratio is a measure of the time in months required to exhaust inventories if sales were to remain at their current level. Real-time CANSIM tables 081-8011, 081-8012 and 081-8015 will be updated on April 9. For more information, consult the document Real-time CANSIM tables.